It is being called "Snow White syndrome" in India, a market where sales of whitening creams are far outstripping those of Coca-Cola and tea. India also has the world's second most lucrative marriage industry - the first being neighbouring China - that has grown to a whopping $40bn a year spent on weddings, dowries, jewellery etc. Fuelling this demand are the country's 75-odd reality TV shows where being fair, lovely and handsome means instant stardom. As a result, the Indian whitening cream market is expanding at a rate of nearly 18% a year. The country's largest research agency, AC Nielsen, estimates that figure will rise to about 25% this year - and the market will be worth an estimated $432m, an all-time high. With the Indian middle class expected to increase 10-fold to 583 million people by 2025, it looks as if things will only get better for the cream makers. But there have been questions by medical experts about the effect of these creams on the skin. The implicit assumption by many is this: the whiter the skin, the more attractive you are. John Abraham, a top Indian actor and model, says: "Indian men want to look better." And he should know. The market is booming like never before. Launched way back in 1978, Hindustan Unilever's Fair & Lovely is the leader in women's lightening skincare, while Calcutta's Emami group leads the male equivalent with its brand, Fair And Handsome. The company calls this brand - launched in 2005 - the world's number one fairness cream. It achieved sales of $13m in 2008-09 and has Shah Rukh Khan, another Bollywood superstar, as its brand ambassador. And then there are female stars endorsing similar products. Katrina Kaif, naturally fair, sells Olay's Natural White while Deepika Padukone sells Neutrogena's Fine Fairness range. Sonam Kapoor sells L'Oreal's White Perfect while Preity Zinta, once a top star, endorsed Fem's Herbal Bleach. And there are many brands on the shelves to choose from: lightening, brightening, clearing, whitening, anti-pigmentation, freshening, anti-dullness and even illuminating. 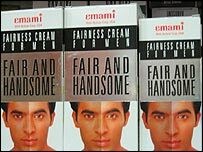 "India is on a fairness hook, everyone wants to look fair," says Mohan Goenka, director of the Calcutta-based Emami group, whose Fair and Handsome brand for men was the first of its kind in the market. A recent study by Hindustan Unilever showed how men in southern states like Tamil Nadu, Kerala, Andhra Pradesh and Karnataka are fervent purchasers of whitening creams. 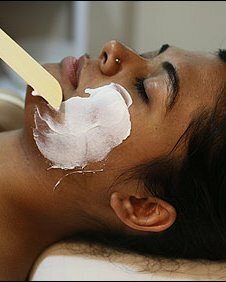 For example, Tamil Nadu has been recording - for the past year - the highest number of sales for Narayanan, a skin-whitening cream from the Unilever stable. Another report in the daily Economic Times says sales of skin-whitening cosmetic products were also high in tribal-dominated states like Jharkhand and Chhattisgarh. "The market in India is huge, really huge," says a Procter & Gamble spokesman. Experts say that demand has boomed because of the tendency to discriminate against a person's skin colour, a practice that is still widespread across rural India. "But if your complexion is fair, you avoid that pinch. Everyone in India wants to be fairer. At times it is repulsive, worse than chalking of geishas' faces in Japan, but everyone wants to have a jar or tube of skin-whitening cream," says fashion designer Rohit Bal, who has dressed Bollywood actresses and visited the sets of reality shows. As a result, the products - priced between 50 cents and $150 a jar/tube - are in great demand countrywide. No study has ever been done to discover what "fairness in four weeks" achieves. Worse, there are several controversies attached to such products. 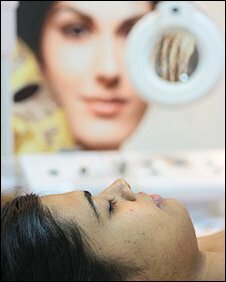 "If you apply anything on the skin, there will obviously be side effects," says Rues VK Sharma, head of the dermatology department at the All India Institute of Medical Sciences. "Very few know that many of these creams contain steroids. Whatever doctors say will always be a drop in the ocean, as advertisements flooding the market have a far larger impact on the minds of people." "We are not selling steroids and to date the company has not been involved in a single lawsuit where someone has blamed us for messing up their skin. Our products are lab-tested and we vouch for it," says Mohan Goenka of the Emami group.